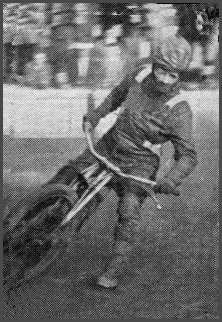 Former cycle speedway rider from London Dave started his speedway career at Rye House in 1954 before doing his National Service which kept him out of speedway for two years. He earned a Southern Area League winners medal with the club in 1954 too. He returned to Rye House in 1957 he improved his average to well over 6.00 points per match and earned a place in Oxford's National Trophy side in 1958 where ten man teams were used. He joined Eastbourne in 1959 and helped them to win the League that year for the first time since 1947. He found it tough in the National League and was loaned to Cradley in 1960 but after 2 matches in September scoring three points against Bristol and five against Sheffield he was not retained by the Heathens. He continued to turn out for Eastbourne in Challenge matches for a couple of years before retiring.